Johne’s disease is a fatal wasting disease of cattle, and is an increasing problem on farms across the UK. Industry focus and retailer pressure have raised the awareness of Johne’s disease, and more and more is being done to attempt to reduce its impact on the dairy sector. One of the largest challenges in combatting Johne’s disease is the early detection of those animals which are infected in order to apply necessary control measures to limit further spread of the disease, both in the herd and between herds. With a few different testing options available, this article discusses some of the points to consider when deciding how best to test your herd. Cows are predominantly infected as calves by ingestion of infected faeces from Johne’s positive cattle, with a slow progression through three stages of disease. Knowing these stages of disease can help in understanding the challenges of testing for Johne’s disease in your herd, and suggest what to expect in the coming years. Johne’s disease is often described as an ‘iceberg disease’, with clinical cases only being a small proportion of the infection in the herd. 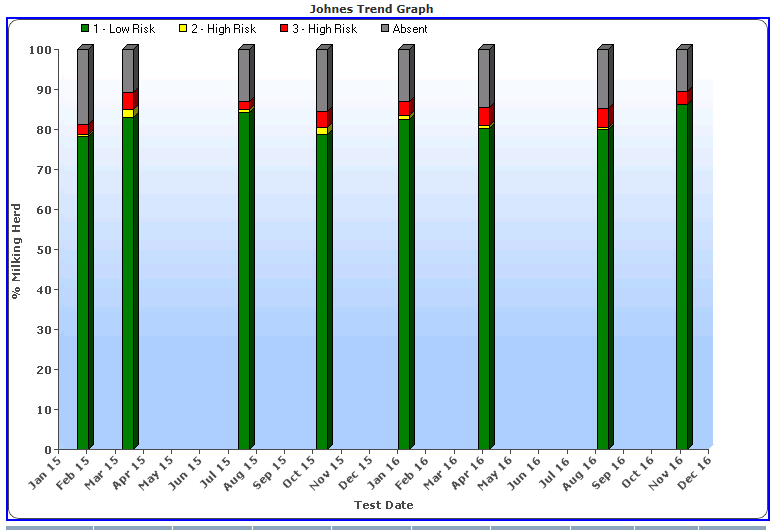 For every animal with clinical signs of Johne’s disease research suggests that there will be 17-25 more infected animals in the herd – not all of which will be detectable: infected animals only begin to become identifiable by testing in stages two and three which is why testing for Johne’s can be challenging. Clinical disease is not the only cost of Johne’s disease, the vast proportion of the costs are from subclinical losses of production: higher culling rates with lower cull values, poorer fertility and higher lameness rates; so it is a disease well worth controlling and eradicating from your herd. There are a few options when it comes to testing your herd for Johne’s disease, but tests can be separated into two main categories – those that test for the presence of the bacteria that cause Johne’s disease, or those that test for an immune response (antibodies) to Johne’s disease. In cases of Johne’s where the disease has progressed to stage two and the cow begins shedding the bacteria it may be possible to culture or grow the bacteria from individual cow muck samples. This is a very slow process, and can often give ‘false negative’ results as the bacteria are very difficult to grow in lab conditions. Faecal culture has largely been replaced by faecal PCR which looks for specific strands of DNA from the bacteria in muck – a much quicker, but more expensive process. Faecal PCR is commonly used to confirm a diagnosis rather than as an initial screen. More commonly, detecting an immune response to Johne’s disease is used to assess infection status. 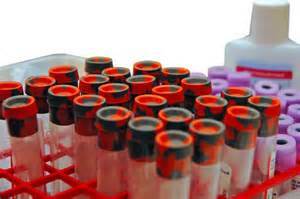 Antibodies can be measured in both blood and milk when cattle enter stage two of the disease. This test offers a cheap and reliable way to test large numbers of animals, with the accuracy of the test improving with repeated tests. Obviously, milk samples are much cheaper and much more convenient to collect from dairy herds than blood samples! Regular milk testing for Johne’s disease offers the most cost effective and convenient way to monitor the Johne’s status of your herd. A single set of results may give a suggestion of the current herd status, but repeated testing allows monitoring of disease trends and increases the likelihood of detecting Johne’s disease when it is present, especially in the early stages of disease when antibody levels can wax and wane. The CIS Johne’s monitoring service offers regular milk testing with further interpretation of the results by a vet, assisting the decision making process. Tracking individual cow and herd levels results over time can demonstrate the scale of the current challenge. This service is appropriate for all dairy herds that are milk recording, with samples from recording being tested at the lab for Johne’s antibodies with no extra hassle on-farm. Monitoring your herd’s infection status is a wise investment whatever your current situation. For herds considered free of Johne’s disease, milk testing can help identify any disease incursion at the earliest opportunity allowing a quick and targeted response. In herds with a high prevalence of Johne’s infected cows, repeated testing can help quantify the problem and identify those cows that are a high risk for transmission of the disease so they can be managed appropriately to deliver long term improvements to the herd. Whatever your herd Johne’s situation – whether known or unknown, please feel free to get in touch to find out more about how the CIS Johne’s monitoring service can benefit you and your cows.